Samsung has, over the last year, been hard at work shoring up its midrange lineup to more effectively compete with an increasingly more cutthroat market thanks to well-priced Chinese competition. Following the A30 and A50, the company today added yet another midranger to its lineup: the A70. The phone's biggest selling point has to be its large, 6.7-inch FHD+ (2400 x 1080) Super AMOLED screen with a nearly cinematic 20:9 aspect ratio, perfect for watching movies in their widescreen glory. That display is one of the company's Infinty-U range, meaning there's a small, semi-circular notch at the top-centre of the phone. Housed within is a 32MP selfie camera with an f/2.0 aperture. Round back, the phone sports a triple-camera setup with a 32MP main camera supplemented by a 5MP depth sensor, and an 8MP ultra-wide sensor. The phone's powered by an as-yet-unnamed octa-core processor and a 4,500 mAh battery that should provide plenty of power throughout the day. Interestingly, the phone also supports 'Super-Fast Charging' up to 25W, which is even more power than the non-5G variants of the company's flagship S10 series. Quite the mark of distinction for a midrange phone - and yet another sign that Samsung is more serious than ever about duking it out with the likes of Oppo, Honor and Huawei in the midrange segment. In terms of biometric security, the phone also features an under-display fingerprint sensor and facial unlocking. It's available in four different colours - Coral, Blue, Black, and White - and will come with either 6 or 8GB of RAM. Internal storage is pegged at 128GB, with the option to expand it by 512GB via a microSD card. On the software side of things, the A70 will support the usual laundry list of Samsung exclusives like Knox, Samsung Pay and Samsung Pass. It will run on Android 9.0 Pie, with Samsung's One UI running on top. The latter's one-handed usability features should be quite the godsend on the phone's large screen. 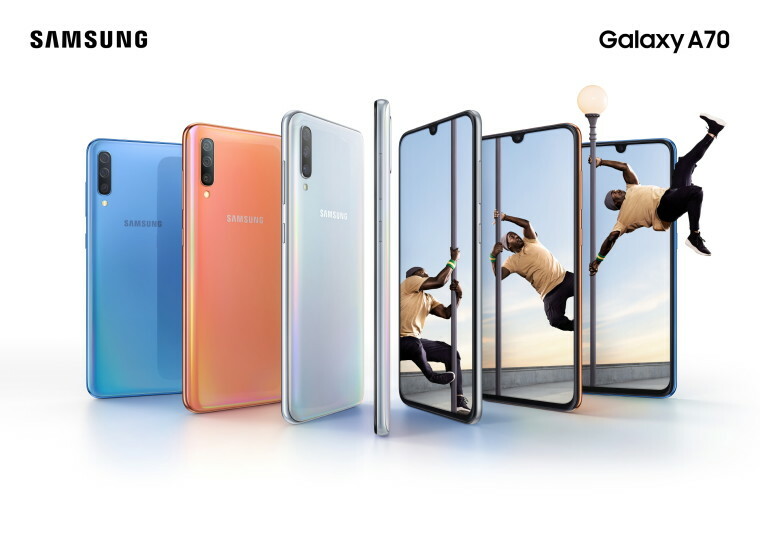 Pricing and availability were not revealed by Samsung in its announcement, but the company is promising to let us know more at its 'A Galaxy Event' on April 10.